Note: Early style water pump assembly. The engine cooling system for the Jowett Javelin and Jupiter motor cars are very similar and, for convenience here, they are termed 'the Jowett engine' cooling system. 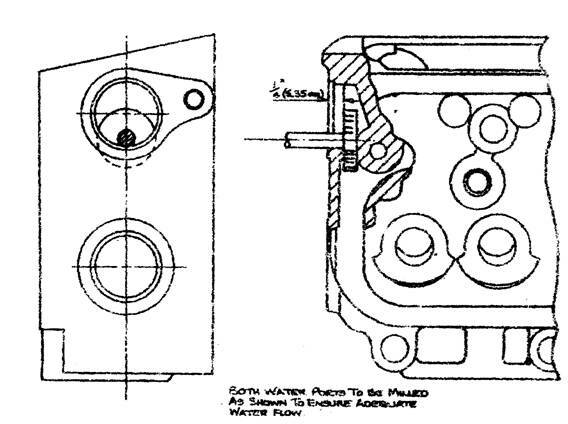 When Jowett Cars Limited wrote their Specification Notes for the Jowett engine cooling system, the system was described as being of the 'thermo-siphon' type – assisted by a water pump. Until the advent of the Javelin saloon and the Jupiter roadster, all Jowett vehicles featured cooling systems of the thermo-siphon type. 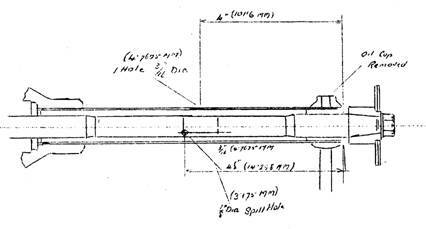 It has been frequently stated that the water pump installation on the Javelin was an afterthought. The same could be said about the Jupiter's water pump installation, but it has been engineered just that much better than its sibling. 1. The radiator is mounted to the rear of and above the level of the top of the crankcase. 2. The water pump pushes hot water into the radiator's header tank . Most other manufacturers' systems have the pump pushing cooled water into the cylinder block. 3. There are two bottom hoses, one for each cylinder bank. 4. On the Javelin there is a single, centrally located top radiator feed. 5. On the Jupiter there is also a single, centrally located top radiator feed that branches into two to feed each end of the radiator header tank. 6. The Javelin was one of the first cars to feature air shroud/duct plates for the cooling fan. 7. The engine cooling system is serviced by two drain taps, one in each cylinder head. The radiator, being the highest point in the system, does not require a drain tap. Even with all of these differences, the Jowett engine cooling system will, if properly maintained, function very well. 1. Air deflectors for the fan were changed to increase the efficiency of air flow. The change related to a curved edge section adjacent to the cooling fan's arc. 2. The water pump front cover was improved by introducing a shroud to better hold water in the impellor until it was time to be discharged to the thermostat housing and on to the radiator (D9 PA 5756). Note: All Club manufacture front covers feature the cast-in shroud. It is now rare to find a pump with the early front cover installed. 3. The fan shaft and rear bushing were increased from 0.500" (12.70 mm) diameter to 0.625" (15.875 mm) diameter. The fan boss retained the ½" BSF threaded mounting centre and lock nut. 4. The fan shaft and fan securing changed to a taper fit with a self locking (Simmons) nut and plain washer. 5. Following difficulties in service when removing the fan from the shaft due to taper lock, a revised taper specification was introduced. 6. The original fan was of the St Andrew's cross type, with ½" BSF threaded mounting. 7. A fan of the St George's cross type with ½" BSF threaded mounting. 8. A fan as in 7., but with first taper mounting. 9. A fan as in 7., but with revised taper mounting (E2 PD 20379). 10. A pressed brass sheet shroud silver soldered or riveted to machined front face of water pump impellor. 11. 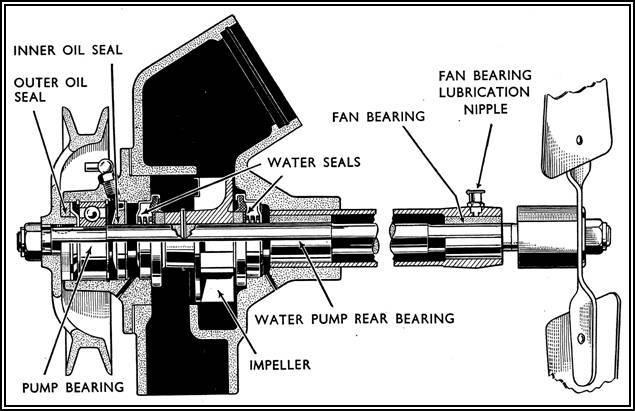 Changes to lubrication methods for fan shaft. 12. Introduction of improved radiator for Jupiter. All available Jowett Cars Limited issued Service Bulletins relating to the engine cooling system are reprinted from Page 7 of this document..
Just like any other mechanical component in a motor car, the engine cooling system can, with great usage and neglect, become worn and tired. This is particularly so in modern times. It is a fact that most Jowett engines are now running in a hotter state than was known some fifty years ago. There are several reasons for this condition, which will be dealt with later. With higher operating temperatures and the banning of some chemicals that used to be used in the manufacture of rubber hoses, engine cooling system flexible hose life is reduced somewhat. Ideally, and to provide peace of mind, the hoses in the cooling system should be changed every two years. Radiator hoses can suffer due to engine coolant having too strong a corrosion inhibitor or anti-freeze mixture. If a glycol based anti-freeze is of to great a proportion of the coolant mix, the hoses will become very soft and will de-laminate. De-lamination is the term used to describe the separation of the inner hose liner coming away from the reinforced part of the outer hose. In severe cases, a water pump can exert sufficient suction to collapse the inner liner, thus restricting coolant flow. This condition may not be easy to diagnose, but if the hose suddenly feels softer, this is a fair indication that de-lamination has occurred. A coolant hose should be a snug fit on the attaching barbs/pipes/housings. It should be of sufficient length to accommodate its securing clamps. There are a number of different style hose clamps available, but care must be exercised when choosing a clamp. Most clamps are of the worm drive type. There are many variations on this theme. Some, that are made from very thin stainless steel, have a coarse pitch worm drive to tighten them. These hose clamps can, if over tightened, twist to the extent that the rubber outer wall of the hose can be severely cut. Too often, such hose clamps can be seen with the rubber projecting through the worm slots. The original wire type of clamp that was used by Jowett Cars Limited, if used as it should be, is a very effective clamp. There is also a very good quality, non-worm drive, clamp made by Würth of Germany. These clamps can be found at swap meets. The band of the clamp has a generous radius at each side, thus being gentle on the rubber hose. The smaller diameter Würth clamps are, in some cases, the only clamp authorised by vehicle manufacturers for fuel injection hose use. There is a technique that should be adopted when installing any new hose. A new hose should be installed onto clean, corrosion-free, hose barbs. The hose clamp should be located to the immediate rear of the raised portion of the hose barb. When installed, the hose itself should be in a relaxed condition. Only use genuine hoses which can be supplied by the Jowett Car Club of Australia Inc.
To avoid corrosion within the cooling system, it is wise to use a suitable corrosion inhibitor. For the Javelin and Jupiter engine, which contain several different metals that make up the cooling system, it is recommended that a good quality corrosion inhibitor such as Tectaloy Xtra Cool Gold, which meets AS2108 2004 B. This is a concentrated formula and one litre will make up fifteen litres of coolant. Add the contents of a one litre bottle to fourteen litres of soft water, fill the engine cooling system and keep the remainder for top-up purposes. This ensures that the original mix is not diluted. Tectaloy Xtra Cool Gold can remain in the cooling system for three (3) years or 37,000 miles, whichever occurs first. Ford R1-3B Corrosion Inhibitor can also be used in a mix by volume of 10% R1-3B and 90% clean soft water. This mixture should be drained, flushed out and replaced with new mixture at two year intervals. It should be noted that these inhibitors are not an antifreeze type inhibitor. If using the motor car in sub-zero temperature, taking into account wind chill factor, conditions, then a propriety type of antifreeze-inhibitor should be used at recommended strengths. The coolant mixture needs to be used with extreme care. The balance between protection and damage is a very delicate chemical specification. Too little inhibitor will mean corrosion problems at the aluminium components. Too much inhibitor in the mixture will result in solder bloom problems in the radiator. For maximum cooling efficiency, the coolant and cooling system internal components must be kept absolutely clean. Most ‘overheating’ concerns are, in most cases, perceived concern. This statement needs clarifying. The Jowett Javelin and Jupiter models are equipped with temperature gauges that provide reasonably accurate readings between 30°C to 100°C. The temperature gauge provides information that can be interpreted by the driver. A modern car's temperature gauge that typically displays Cold – Normal – Hot does not provide specific information, and the 'Normal' segment can be covered by a large arc of the indicator needle. The question needs to be asked – What is the 'Normal' operating temperature for the Jowett engine? Most are aware that 75°C can be considered to be the normal operating temperature, simply because it is located at mid-point on the gauge scale. Fair enough. Others know that the engine is equipped with a 75°C opening thermostat and, therefore, the 'normal' operating temperature is 75°C. again, a fair assumption can be made. That is all very well, but care needs to be taken when interpreting the 'normal' operating temperature. 1. The cooling system's design criteria probably allows for 'normal' reading at ambient temperatures in the range of – 10°C to + 25°C. 2. If the ambient temperature is higher than 25°C, then the cooling system will operate at a proportionately higher 'normal' operating temperature. This higher operating temperature can be as high as 87°C, providing the engine and its cooling system are in good condition, without any cause for alarm. 3. Accumulation of dust, oil, insects and other debris on the engine and radiator will cause higher operating temperatures. 4. Excessive thickness paint on a radiator will form a very good insulation layer. 5. Scale inside an engine's cooling system also forms an excellent insulator. 6. It is possible that modern petrols do burn (combustion) at higher temperatures. 7. In metropolitan areas, modern traffic conditions cause the engine to be running at low-idle for long periods with minimal air flow through the radiator core. In this situation, should the operating temperature drop back to 'normal' once out on the open road, there is nothing inherently wrong with the cooling system. 8. A slipping fan belt can cause high operating temperatures. The drive belt should be wedged in the pulley Vee, if running in the bottom of the Vee, the belt will slip. 9. Wind direction can have an effect on operating temperatures. Javelins can be affected more if the wind is from one side than from the other side. 10. Removing the thermostat to effect a cure for a perceived overheating concern is not a recommended practice.